Thinning out your garden plants. It’s far better to have one-tenth of the crop flourishing than the whole lot malnourished and spindly. at the same time. You cannot, however, trans- plant all seedlings. Root crops will probably fork if seedlings are transplanted but most ornamentals and leaf vegetables can be moved. Before either thinning out or transplanting, water the rows well. 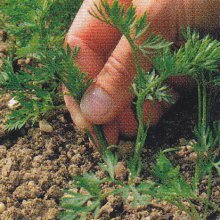 To thin seedlings, simply pull up unwanted seedlings, leaving the remaining plants at the required distance from each other. Put the thinnings into a seed tray and remove them to the compost heap. Left on the ground, the bruised stems attract pests. If you need thinnings for transplanting, then you must take more care when handling the seedlings. Thin to leave one row of seedlings at the required spacing, then transplant the rest in new rows as recommended. Planter-sown seedlings need to be thinned or transplanted, into a larger seed tray or planter when they are large enough to handle. Before they are planted out, seedlings grown in the greenhouse must be acclimated to the colder conditions. Do this by placing them first into a closed, unheated cold frame. Then gradually open up the frame a little during the day and, finally, a little at night as well, until you leave it completely open.